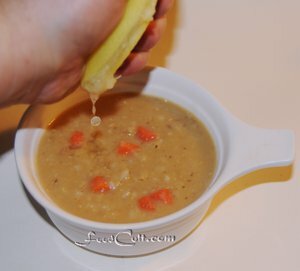 Galganov's Free Recipe for Lentil or Dahl Soup! Let's go make some fantastic Lentil Soup! Heat a little oil in the pot. Add bay leaves, cardamom pods and onion to the pot and fry, stiring constantly, until the onion becomes shiny. Add 2 Cups water to the pot and gring to a boil. When water is boiling add red lentils. Stir in. Simmer stirring regularly to prevent sticking. At about 10 minutes the water will seem almost gone. Add 1 C water and stir. Cook an additional 10 minutes (or until the lentils turn yellow and are soft). remove the cardamon and mash the lentils with the potato masher. You are not seeking a perfectly smooth consistency ... just to break up the lentils. Return the cardomom to the post (they are not for eating but will continue to impart their flavour to the soup). Optional: Add the carrot and continue cooking about 15 minutes 'til the carrot is soft to taste. Add 1/2 tsp salt and stir well. Everything is optional. We like some black cardamon and so, start with 2 of those and, usually, about 5 green cardamons. Add a little finely diced tomato and some minced hot finger pepper for a different taste. If the soup isn't salty enough add salt in small amounts (maybe 1/4 tsp) at a time. Lentil is a staple in many parts of the world. it is, after all, a high quality, affordable, vegan protien. We first stated Lentil Soup as "Dahl (or 'Dal') Soup", an Indian dish. We've since had it as middle easter as well. It grows well in many countries. India is one of the top two of growers, exceeded only by Canada (as of 2012). The third ranked producer grows barely half of India's production. One of our favourites is yellow soup (made with red lentils) This soup is served with lots of lemon juice ... a soured soup. This soup can, also, be "meated" up, by the bowl, with the addition of your favourite sausage ... or add some diced cheese to a bowl ... Keep the pot of soup vegan while satisfying everyone's preference.